Newly renovated Hilton DoubleTree - July of 2014. We hope you enjoy your stay. Welcome to DoubleTree by Hilton Hotel Vancouver Washington where our friendly staff looks forward to greeting you with a signature warm chocolate chip cookie at check-in. Situated in front of a business park in the Columbia River valley this modern hotel is near popular restaurants and corporate offices including Peacehealth Fisher Investments SEH and HP. 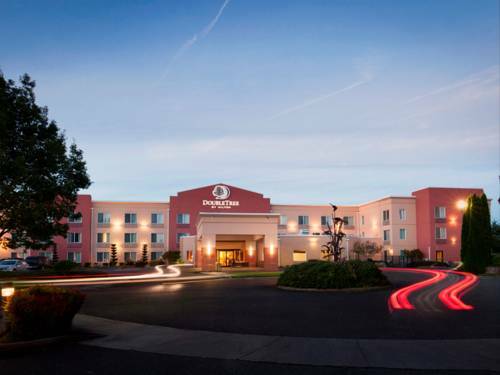 Enjoy convenient access to downtown Vancouver and downtown Portland just 15 minutes from this Vancouver WA hotel. The Columbia River is only minutes away and Portland International Airport is just six miles northeast. Visit historic attractions like Fort Vancouver and Pearson Air Museum easily reached from our hotel in Vancouver Washington. Unwind in a spacious guest room equipped with complimentary WiFi a 38-inch HDTV a mini-refrigerator a microwave and a separate seating area and work space. Upgrade to an inviting suite for additional space and amenities - ideal for families and small business meetings. With 1 900 sq. ft. of events space comprised of a large open meeting room and a smaller boardroom. audio/visual equipment a 24-hour business center innovative catering services and a professional staff this hotel in Vancouver WA is ideal for a variety of functions. Energize with contemporary Precor equipment in the complimentary fitness center or refresh in the indoor swimming pool or whirlpool. Take advantage of good weather on the outdoor patio which offers seating and a cooking grill. Enjoy locally sourced food and drinks in the relaxed atmosphere of the Northwest-inspired Press NW Bistro - Bar or take advantage of their delicious grab-and-go* options. Locally sourced food in a modern yet casual atmosphere. Dine here or grab and go options. The farm at the Benedictine abbey produced some magnificent animal freaks and record-setting contents of a pig's stomach, thoughtfully preserved for your quiet contemplation.